Entering Kindergarten is such an exciting time for both the parents and the child. 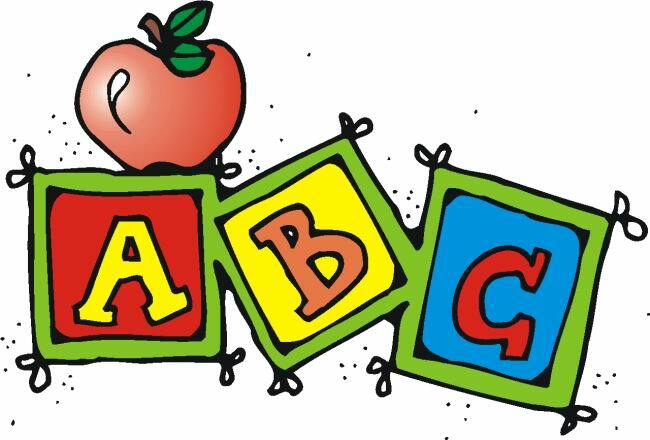 Whether this is your first time to send a little one to Kindergarten or you have had others in Kindergarten before, we hope that the ABC's of Kindergarten will give you a little information about Kindergarten at Hassler. Alphabet Knowledge – We will learn the letters of the alphabet and the sounds that the letters make in Kindergarten. Arrival – Your child should come to school no earlier than 7:45am. There will be NO supervision outside until 7:45am. The first bell rings at 8:00am. which is the start of the school day. The tardy bell rings at 8:15am. Assessment – We will use several instruments to assess students in Kindergarten. We will give the Texas Primary Reading Inventory (TPRI). This assessment helps identify children at risk for reading difficulties and helps set learning objectives and develop instructional plans for these at-risk children (ARI). Children will be given report cards approximately every nine weeks. Children will also be assessed for AMI groups. This program is like the reading program, but concentrates on math skills. Attendance – Regular school attendance is essential for your child to make the most of his/her education. Please make every effort to have your child at school every day. Excessive absences hinder a child’s progress. If your child is absent, you must send a written note to the school when he/she returns. Please send a Doctor’s note when applicable. Our Attendance & Registrar, Ms. Lori Studdard, can be reached by calling Hassler at 832-484-7100. Backpacks – Your child’s backpack should be big enough to hold binders. Backpacks help your child carry folders, notes, projects and books to and from school. Please check your child’s backpack every day. Please do not send your child with a backpack that has wheels. Birthdays – Birthdays are very important to children. Remember it is school policy that no food may be brought in from the outside due to the allergies of many children. Treats may be purchased in the cafeteria by ordering through our Cafeteria Manager at 832-484-7090. Please do not send birthday invitations to school to be passed out unless they are for your child's entire whole class. Book orders – Book order forms may be sent home each month for you and your child to look over. If you want to place an order, please make out the check to the book club and return it to school, or you can order online. Clothing – Please dress your child in comfortable clothing that is appropriate for Kindergarten. KISD has a dress code in the Handbook that will be enforced. Please label all coats, sweaters and lunch boxes with your child’s first and last name. Communication – Communication between home and school is very important. If you feel the need to talk to the teacher, please call the school, send a note, or email the teacher. The teacher will get back with you as soon as they can. Computers – We have multiple computers in our classroom and each computer has internet access. Your child will be taught the proper way to use a computer. Our class will have a weekly computer time at the computer lab as well. Conduct charts – A conduct chart will be sent home daily. Please review it with your child and sign/initial it daily. Contact your teacher with concerns over conduct reports. Conferences – If you feel the need to conference with your child’s teacher, please call the school, send a note, or e-mail to make arrangements for scheduling a conference. Regular Parent/Teacher conferences will be held in the Fall. Discipline folder – Discipline issues will be recorded in your child's Tuesday folder. You should review the folder with your child. Please sign and return the folder on Wednesday. Dismissal – Dismissal is at 3:20pm. Please do not come to the classroom to pick up your child. Your child will be dismissed by the teacher and will go to the designated pick up locations. Bus riders will go to the cafeteria. Car riders will go to the front porch by the flag pole. Walkers and bike riders will go out the side door by the bike racks. You may meet your walker/bike rider outside the side door by the bike rack. Dress code – Students should be dressed in accordance to the KISD dress code. This is in the district Handbook. Early dismissal – If you will be taking your child out for an early dismissal, you must send a note to the school the day of early dismissal. Your child will be ready for you in the front office. In the morning, the student will come to the front office with the note to get an early release sticker so that they will come to the office at the designated time. You can pick up your student and sign them out through the Attendance office. Email – You can find the teacher’s email addresses on the Hassler website. Emergency cards – Your child will have an emergency card on file in the Clinic. At least two working phone numbers are required in order to contact parents in case of illness or emergency. All parents/guardians who may possibly check a child out of school must sign this card. Fire Drills – Your child will participate in frequent fire drills throughout the year. We will practice the procedures before our first fire drill so that your child will be prepared. Fundraisers – Our school participates in several fundraisers throughout the year to raise money for various things for our school. We hope that everyone can participate, but it is not required. Guidance – Our school counselor will conduct several guidance lessons throughout the year. Mrs. Adria Stacha is our counselor. Handwriting – We use Handwriting Without Tears at Hassler Elementary. You will receive a handout about this at Meet the Teacher. Please practice the correct strokes with your child. Check the PTO calendar for the date and time for Meet the Teacher. Illness – Please do not send your child to school with a fever. He/She should be fever free, without the use of pain relievers/fever reducing medicine, for at least 24 hours. If your child becomes ill at school, you will be called to come and get your child. We need at least two working phone numbers on file to contact you in case of illness or emergency. Immunizations – All students must be immunized against certain diseases. Proof of immunizations must be presented to the school at the time of enrollment. Journal writing – We will spend time everyday writing in our journals. Journal writing is a process that begins with scribble. You should see growth in your child’s writing throughout the year. Learning Centers – We use learning centers in the classroom for active play. When we are in learning centers, we are learning to cooperate with others. Library – We have scheduled library time every week. Kindergarten students will check out a book every week. The book must be returned the following week in order to check out a new book. Literacy Stations – Literacy stations are used while we meet with small groups of children for guided reading. Lunch – The cost of lunch is $2.05 and $.40 for reduced lunch. If you would like to purchase a lunch and eat with your child, the cost will be $3.25. Our lunch time is approximately 10:45 a.m. -11:15 a.m. You will get a schedule from your child's teacher at the beginning of the year. To have lunch with your child, you are required to sign in at the front office and wait for your child's class in the cafeteria. Each child will be given a lunch number. You may put money into their account by going to PayPams or sending a check to the school. You may also block their account so no extra items may be purchased on the PayPams website. Music – We will have a scheduled 45 minute music class 2 times a week. Notes – Look for notes from the office and from the teacher to come home in your child’s Tuesday folder. Nurse’s Clinic – Should your child get ill, the school nurse will take care of your child until you can be reached to pick him/her up from school. She also administers all medications to students during school hours. Outside – Your child will have outside time daily, weather permitting. Please dress your child appropriately for the weather. As long as it is not raining, all students will go outside. Please send your child to school with a coat, labeled with their first and last name, on cold days! You can create an account for yourself as parent/guardian. Parent Involvement – We love parent involvement! Please be as involved in your child’s kindergarten year as much as you can. Parent Reader – You may sign up to be a parent reader for your child's classroom. A parent reader reads to the class 30 minutes per week. The frequency will be determined by the amount of volunteers that sign up. The time and day of the week will be determined by your child’s teacher. The students love having visitors reading to them!! In order to be a Parent Reader, you must be a registered volunteer with KISD. Parties – We will have several parties during the year including a Winter Holiday Party and a Valentine’s Day Party. The PTO will share information on these parties several weeks ahead of time. Physical Education – We have a scheduled 45 minute Physical Education class 3 times weekly. It is required to wear tennis shoes on those days. Pledge of Allegiance and Moment of Silence – Each morning we will recite the Pledge of Allegiance to the United States and Texas flags and observe a moment of silence. PTO – All parents are encouraged to join the school’s PTO. Learn about joining the PTO here! Volunteering is not a requirement of joining the PTO, but all help is appreciated greatly! Questions – Please contact us if you have any questions or concerns regarding your child’s education. We will make every effort to meet with you and discuss your concerns. Read – Read to your child daily and let your child see you read daily. Recess – Your child will have recess every day, weather permitting. No visitors are allowed on the playground during recess. Report cards – We have an approximately nine week grading period. Your child will receive a report card each grading period. Please sign it and return it to the teacher. Restroom – We will have restroom breaks several times during the day. Your child will also be allowed to go at other times if needed. Unfortunately accidents will happen and we will make sure your child is sent to the nurse’s clinic for a change of clothes. Please keep a change of clothes in your child’s backpack. Room Helpers – We love volunteers in our classroom! Room Helpers can help with crafts, reading, Tuesday Folder assembly, or other things the teacher may need help with. To volunteer in the class, read here about getting registered. Rules – We have four rules at Hassler. Safety – Your child’s safety is top priority. We take every precaution when your child is in our care. Please send a note with your child, email your child's teacher, or call the school if he/she is to go home a different way. We will not send them a different way unless we have a notice from you. Schedule – Our schedule includes Journal writing, calendar, language arts block, lunch, recess, math, science, social studies, snack and center time. A detailed schedule will be available from your child's teacher. School Store – Students may purchase school supplies or fun Hassler spirit items. The store is open every morning from 8:00-8:15am although shopping days will depend on your child's teacher’s schedule. The school store is located in the main hallway between the Art room and the cafeteria. School supplies – You may buy prepackaged school supplies at EPI using the code HAS006. Sometimes we run out of certain items and we may ask you to replace them during the year. Shoes – It is very important to wear comfortable shoes. We suggest closed toed shoes for all our kindergarteners. Tennis shoes are required on PE days. Please work with your child on learning how to tie their shoes! Snacks – We do have a snack time in the afternoon every day. If you wish, you may provide a snack for your child. Teachers will not provide snacks. Please send only healthy snacks (no candy or drinks). Some examples are: Goldfish, animal crackers, fruit and cheese crackers. Student of the Week – Every week we will have a student of the week. You will be notified when it is your child’s week. Your child will bring pictures of himself/herself to share with the class. Tardies – Students late to school (after 8:15am) are considered tardy. We will keep a record of these tardies and will document them on your child’s report card. There will be opportunity time for those students with excessive tardies. Toys – Toys from home are not allowed unless they are brought for Show and Tell or student of the week activities. Transportation – If your child will be going home a different way than what we have in our files; you must send us a note, email or call. We will not let your child go with another adult or a different way unless you have notified us. Tuesday Folders – Every Tuesday you will receive your child’s folder containing his/her week’s work. It will also have his/her conduct grades for the week. Please review the papers with your child and check for notes. Please sign and return the folder on Wednesday. Units and Themes – We will study many units and themes this year. Visitors – Please make sure that you sign in at the front office before you come to the classroom. We will be looking for your sticker when you are in the school. To learn about the visiting Hassler, read here. Volunteers – We always need volunteers. If you are interested in volunteering, click here to get started! Water bottles – You may send a water bottle with your child when the weather is hot outside. Please try to send the bottles with the push top. Web page – Each teacher will have a web page. You can access teacher websites through the Hassler website. Extra – We think your children are eXtra special!! Yearbook – You will have a chance to buy a yearbook in the Spring. The yearbook is a great way to capture special memories at Hassler! Zero the Hero – Zero the Hero will come and visit our classroom every 10th day of school. This is part of our calendar math. ZZZZZ’s – Your child should get plenty of rest each night. Kindergarten students require 10-12 hours of sleep a day. It is important for your child to be alert and ready to learn each day. Set a bedtime and be consistent.